In our previous media alert, we described ‘the panic-driven hysterical hate-fest campaign’ being waged against Labour leadership candidate Jeremy Corbyn right across the corporate media ‘spectrum’. Elliot would only concede that ‘in the early days of Corbyn’s charge, the readers rightly got a sniff that on occasions we weren’t taking him seriously enough. That has changed…’. ‘I am sorry but I have set out all that I had time and resource to do. I cannot help you further. ‘Those inside the Westminster bubble have been transfixed, indeed bewildered, by Jeremy Corbyn’s soaring campaign for Labour leader. The more he is denounced, the better he seems to do. 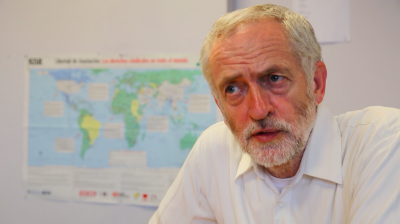 ‘But the reason I won’t vote for Corbyn is that, underneath his appealing slogans and rousing values, there is no programmatic substance… His economic policy amounts to an unelectable platform of “tax and spend” – an anguished cry of protest, not a serious alternative for a Labour government… He demonstrates little understanding of the immensely arduous challenge of electing, let alone running, a social democratic or democratic socialist government…’. If this isn’t clear enough, a simple observation should make it clearer: there is more damning personal and political criticism in this single piece on Corbyn than we found in several hundred Guardian articles on Burnham, Cooper and Kendall over the last month combined. Comedian Frankie Boyle wrote a piece criticising ‘passive’ Labour. He referred obliquely to ‘leadership candidacy androids’ who lack ‘personality and charm’ in a party that is to the right of John Major. Burnham, Cooper and Kendall were not mentioned by name; their role as New Labour Blairites supporting the Iraq crime and other horrors was not discussed. Seumas Milne, the Guardian’s resident leftist fig-leaf, also referred to the ‘New Labour machine politician’ alternative to Corbyn, supplying rare, substantial criticism of the other candidates for moving ‘sharply to the right’. And yet his campaign began ‘with a speech at the City offices of a corporation associated with huge tax avoidance…’. Yvette Cooper exhibits ‘that awful modern Labour tendency to boil even the great causes of the age down to borderline inanity and talk to people as if they are stupid’. The Worm-Eating Stage – Think Of Your Children! The Guardian’s Suzanne Moore described Corbyn as a ‘slightly less feral version of Ken Livingstone’. Moore understood why the less enlightened were attracted to Corbyn’s authenticity, ‘but Blair is right, surely, to talk of the challenges of the future’. Moore thus respectfully cited, and sided with, one of the great neocon war criminals of our time. If Corbyn’s campaign achieves nothing else, it has already exposed the reality that the deaths of one million human beings in Iraq have done nothing to alter the Guardian Blairites’ view of their idol. The ‘most memorable, salient, powerful thing about Blair’ was that he sold himself to one of the most vicious hard-right US regimes in living memory. And of course no journalist in the Guardian has sought to identify the right ‘truncheon’ to ‘neutralise’ Burnham, Cooper or Kendall. Chris Elliott recommendedthis piece to a reader outraged by the Guardian’s negative coverage. ‘If this were a job interview, Corbyn would have already been shown the door. And not just because of his age – 66. Corbyn is the anti-Blair, in every way. Whereas you cannot be unaware of Blair when he is in the room (he is all charisma), you might well not notice Corbyn arriving or leaving. For younger readers, ‘Citizen Smith’ was a reference to a 1970s BBC comedy series that mocked a deluded, preachy, unemployed London leftist who had dreams of leading a Cuban-style revolution from Tooting, with his grandiose dreams always ending in pathetic farce. The conclusion was as haughtily dismissive: ‘Like the rest of the country, Corbyn doesn’t think he has a chance of winning.’ Elliott also recommended this piece to the reader angered by negative Guardian coverage. By dramatic contrast, the Guardian’s front-page interview with Yvette Cooper was deferential to the point of cringe-making idolatry. No comparable news report has warned of the ‘disaster’ – for the climate, for victims of US-UK ‘humanitarian intervention’, for the poor in Britain – if one of the three other candidates is elected. The piece mentioned Corbyn’s ‘self-proclaimed “parsimonious MP’s” lack of visible humour’. Corbyn ‘never had the ambition or the appetite that this job requires’; he has ‘been cheerfully disloyal to every Labour leader he’s ever served under’, and so on. Chris Elliott’s response mocks his claim to be a genuinely independent readers’ editor. Has the Guardian published favourable comment pieces about Corbyn? Quite obviously, yes. Does that mean the Guardian has been fair, impartial and unbiased in its coverage of Corbyn’s campaign? Absolutely not. As we have seen, high-profile Guardian journalists and others have been lined up to direct a flood of ‘disaster’ warnings, dismissals, derision, disbelief and mockery at Corbyn, and only Corbyn. Nothing remotely comparable has been directed at Burnham, Cooper or Kendall. This is a spectacular example of bias. Put simply, like the rest of the ‘mainstream’ media, the Guardian – a major corporation deeply embedded in the ‘centrist’ political and economic establishment – is waging a propaganda war on British democratic choice.